Chelsea loanee Kenneth Omeruo was in action for 90 minutes on Sunday afternoon as his La Liga side Leganes thrashed ten man Real Betis 3-0 at their Estadio Municipal Butarque. 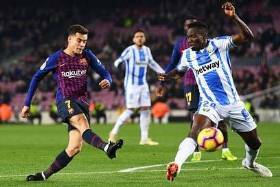 Omeruo, playing in his 16th league game of the campaign, was also booked, a yellow card in the 53rd minute which was his third of the season in the Spanish top flight. Leganes' goals were all scored by Morocco international Youssef En-Nesyri who became the first Leganes player to score a hat-trick in the the Spanish topflight. According to stats by Whoscored, Omeruo had 33 touches of the ball, won one aerial duel, completed one dribble, made one tackle, one interception and had a game-high seven clearances against Real Bestis. The win takes CD Leganes up to the 11th place in the table with 29 points. They travel to Real Sociedad in their next fixture.